3D Printer Power Supply Cover (for LED PSU) Safety First! ToyREP Power Supply Cover by thorgal is licensed under the Creative Commons - Attribution - Share Alike license. This is an upgrade for ToyREP 3D Printer, that will allow you to attach LED power supply under the Y axis, so it is a solid part of the printer. Cover is now available for two sizes. Use ToyREP-PSU1 for 111x78x36mm or ToyREP-PSU2 for 129x99x38mm. The instructions are the same for both. It have a main power switch and covering all the dangerous connections to make the printer safer. As was already mentioned in the printer description, 40W 12V should be just enough for hotend and movement. For 100x100mm heat bed you will need approximately another 40W. That makes total 80W. I am currently using 75W PSU. 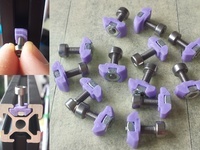 It is sufficient for printing when heaters are already heated up and consuming less energy, but I have to be cautious and not switch heat bed and hotend at once. The major disadvantage of this thing is, that PSU have to be installed at the very beginning of ToyREP assembly. For latter upgrade you will have to disassemble almost the whole printer. Heatshrink - 100mm dia 5mm. Pictures are for PSU1 version, but should be valid for PSU2 too. Print the cover from enclosed file. Mine was made of ABS, 0.5mm noozle, 0.25mm thick layers. 2 outlines, 3 top and bottom layers, 30% hexagonal infill. Clean it and try to push M8 Rod through. Also try to install and remove the power switch from the cover. If you are going to use PC power cable, just cut off the end with PC euro connector and keep the power socket plug. Cut off an other 150mm of cable for internal connections. Strip of the outer layer on the 150mm piece and keep just the blue and brown wires. Remove insulation on the ends of the wires. One end should be a bit longer if you are going to turn it around the screws of PSU connectors. Strip also the ends of the DC power cable that will lead from PSU to Ramps. This two line cable should have one cable with black and an other with red colour insulation. 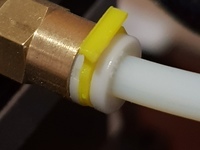 Attach separate brown cable to the switch and cover the naked joint with a piece of heatshrink. If you have switch witch light, You will also have to connect the separate blue piece to the second circuit. Put power cable through round hole near the opening for power switch from outside to inside. Than take the naked ends out through the hole for power switch. Place heatshrink on cables that are going to be attached to switch. Solder brown and eventually blue cable to the remaining connectors on the switch. Connect yellow-green cable to earthing screw of the PSU. Place brown cable on L screw and blue on N screw. Install also two line cable. Red to V+ and black to V-. Put the 12V power cable from inside out through bottom round hole in the cover. Place the rod through the cover and bend wires around it. You can use zip ties, to clean the mess a bit. 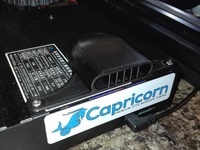 Before you will close the PSU and install it into the printer, test if everything is running, and PSU is secure. Measure the output voltage and if needed adjust it to 12V with trimmer. Place the cover over the connectors of PSU and tighten it atleast from one side with 3x13 wood screw. With M3x6 or M3x8 countersunk screws tighten the PSU to the PCB1 and PCB2 part of the printer. 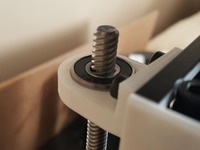 Place these holders on the two X axis threaded rods, with washers and nuts and build the whole rest of the printer around it :D.
Be very careful when installing PSU as threaded rods may damage insulation on wires! If possible cover internal part of the threaded rod with duck tape. Say thanks by giving thorgal a tip and help them continue to share amazing Things with the Thingiverse community.